After having spent several bewildering & enchanting days in company of Carson’s Autobiography of Red, I’m moving on to blue, or more precisely Bluets. Bluets, by Maggie Nelson is (if I am to be honest), in its own ways, just as amazing as Carson’s Red. A lyrical, philosophical, and often explicit exploration of personal suffering and the limitations of vision and love, as refracted through the color blue, while folding in, and responding to, the divergent voices and preoccupations of such generative figures as Wittgenstein, Sei Shonagon, William Gass and Joan Mitchell. 2) And so I fell in love with a color – in this case, the color blue – as if falling under a spell, a spell I fought to stay under and get out from under, in turns. 33) … At times I fake my enthusiasm. At others I fear I am incapable of communicating the depth of it. 51) You might as well act as if objects had the colors, the Encyclopedia says. – Well, it is as you please. But what would it look like to act otherwise? Maggie Nelson (1973) is the author of four books of poetry and four books of criticism. She has won a number of awards, including a 2010 Guggenheim Fellowship in Nonfiction and a 2011 National Endowment for the Arts Fellowship in Poetry. Her most recent book is The Art of Cruelty: A Reckoning. The Klee piece is a brilliant accompaniment to this post!! I’m very fond of Klee, and for Nelson I wanted something that could capture a sort of strangeness with some humor. 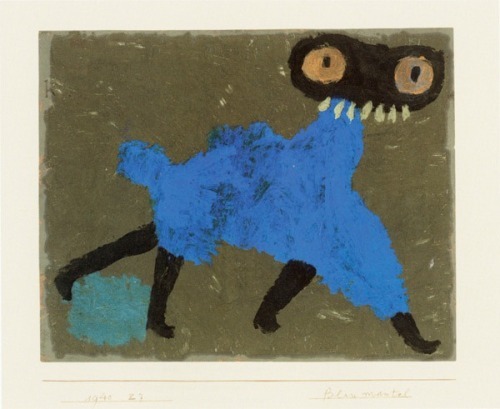 Blue is the color of melancholy, but for Nelson is also very much more – as for Klee. I don’t know Maggie Nelson’s book but I have one I haven’t read yet by Michael Taussig on the colour blue! That Klee is definitely weird. thank you for bringing this to my attention! i love books like these, but you really have to stumble upon them. it’s like the love for a book gives way to other readers. lovely post, again.